The Fox Park Neighborhood has a wonderful variety of sidewalk markers. 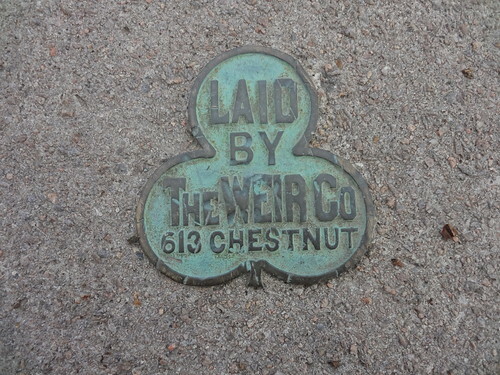 My personal favorite is The Weir Co’s clover-shaped marker. The bold lettering and design do a good job of catching the eye. This marker really demonstrates the pride its layer takes in his work. Less than a block away is the American Granit Flagging Company. 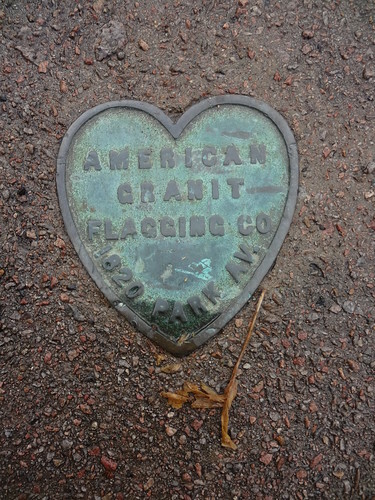 Unfortunately I was unable to locate any information online about either American Granit Flagging or The Weir Co.
St. Louis has so many miles of historic sidewalks that I doubt I’ll every be able to walk down them all, but I’m going to keep on trying. S.P. McKelvey & Co was a big player in the sidewalk business of late 19th Century St. Louis. A company he helped run, The St. Louis Flagstone Company, was in the sidewalk business starting in 1882 according to The Industries of St. Louis by J. W. Leonard (1887). St. Louis Flagstone Company. — H. L. Haydel, Cashier; S. P. McKelvey, Superintendent; Stone Sidewalks; 618 Chestnut street. — This business was established in 1882 and has been conducted with steadily increasing success from that time to the present. The company have been city contractors for paving and flagging for the past three years. They handle every description of stone and have a very large business in laying sidewalks for property owners. 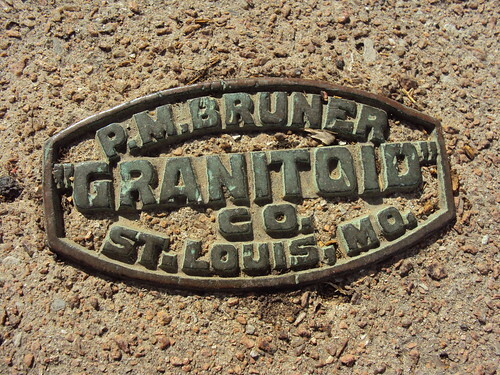 About a year ago, Messrs. Haydel and McKelvey bought a half interest in the firm of P. M. Bruner & Co., manufacturers of Granitoid. Up to this writing the firm have made contracts during the present year for laying over 60,000 feet of stone flagging. They possess unsurpassed facilities for carrying on work in their line, and every contract taken by them is executed in a workmanlike manner, and to the entire satisfaction of the customer. Mr. Haydel is treasurer and Mr. McKelvey secretary of the St. Louis Reclining Car Seat Co., and both are gentlemen of superior business attainments, enjoying, in a marked degree, the esteem and confidence of the business community. In 1890, he started S.P. McKelvey & Company. The marvelous improvements effected in the manufacture of material for sidewalks, driveways, cellar floors, etc., has effected a complete revolution in the cement trade, and opened up fresh fields of usefulness for its representatives. One of the principal of these in St. Louis, although but recently established, the date being August 1, 1890, is the house of Messrs. S. P. McKelvey & Co., of suite 409, Commercial building. The members of the firm are Messrs. S. P. McKelvey, Frank Sullivan and R. G. Mayhew. Mr. McKelvey is a resident of Chicago, where he is connected with the Granitoid Company of that city. The granite composition stone laid down by this firm is, as its name implies, a mixture of crushed granite with cement, and presents all the desirable features of the solid stone. It is made as required at the scene of operations, and is unrivaled for sidewalks, drives, curbs, gutters, basement floors, brewery and malt house floors, steps, copings, etc., being absolutely impervious to the weather, and as durable as the stone itself. They have just completed a very extensive set of steps for the Grand Avenue Presbyterian Church, containing ten rises twenty-five feet long, with no joints whatever. They are prepared to execute the largest contracts in this useful department of industry with promptitude, and guarantee in every case perfect satisfaction. The house is rapidly acquiring a splendid connection in the city and its environs, and some idea of its rapid development may be obtained from the fact that during the first nine months of 1891, business to the value of $125,000 was transacted. Mr. Sullivan is a native of Ireland, and Mr. Mayhew of Germany, both gentlemen being popular and respected in all circles of the city. Their office is elegant in its appointments and furniture, and has every convenience for the accommodation of customers, such as telephonic communication (call No. 1461) etc. This is a pushing and enterprising house that deservedly merits its success. The company certainly did fine work, judging from the current state of their surviving sidewalks and by the prevalence of sidewalks that they constructed. The following is a continued history of S.P. 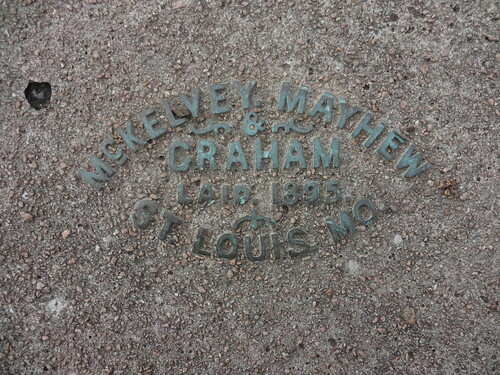 McKelvey & Co through photographs of dated sidewalk markers. By 1895 the company was called McKelvey, Mayhew and Graham. Just a year later, Mayhew & Graham were alone but were including the text “Successors to S.P. McKelvey & Co” on their sidewalk markers and in their advertisements. Mayhew & Graham – Successors to S.P. McKelvey & Co.
By 1898 Mayhew and Graham no longer needed the reference. 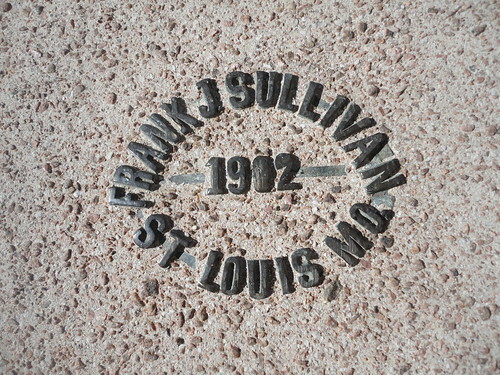 Frank Sullivan (an original member of S.P. McKelvey & Company) had parted ways at least as early as 1896 (the oldest marker of his that I’ve found), but didn’t stray too far from the format of the marker that had been used at S. P. McKelvey & Co. a decade earlier. By 1903 Graham was also out on his own. 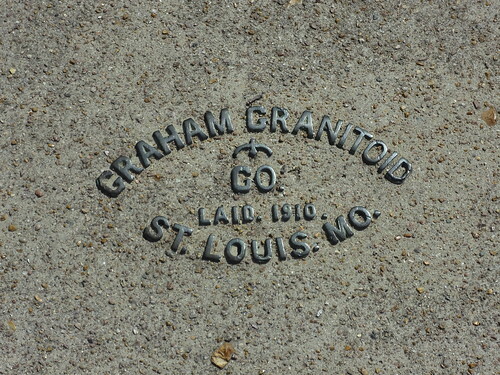 Graham was in the Granitoid business at least until 1910 (the most recently dated sidewalk marker of his that I’ve found). It’s amazing to be able to see this history preserved all over the city. As I encounter more of this company’s work, I will post updates here. This weekend I hit a lucky streak and found three sidewalk markers in the City of St. Louis that I had never come across before. For some reason, in other cities I am able to spot these sidewalk stamps all over the place, but in St. Louis they’re able to elude me. After this weekend, however, I am sure that there are many more out there. In the above photograph is my first spotting of the weekend. It is located directly in front of the entrance to the St. Louis Braid Co. on Lucas Street, a location where I am sure it is appreciated. On Google books I was able to find an advertisement for Mayhew & Graham in the 1896 publication, Water and Sewage Works, Volume 11. 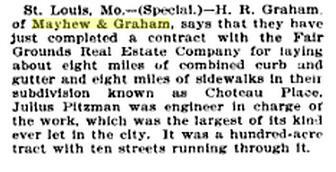 According to an article in the same publication, Mayhew and Graham was reported as having “just completed a contract…for laying…eight miles of sidewalks in…Choteau Place”, referring to the Choteau Place Addition in the Greater Ville. This next sidewalk marker, from the F.B. Klein Granitoid Company, also has a little bit of history that can be traced via Google. Located at 1424 Blair Avenue just north of Downtown, F.B. Klein was at least an occasional buyer of P.M. Bruner’s Granitoid according to the clipping below. Ironically, just a few yards ahead of the F.B. Klein marker was a P.M. Bruner. At this point I have come across many P.M. Bruner Sidewalk Markers (at least two different variations) and have seen even more in photographs on the internet. His influence may spread at least as far as Seattle, as my speculative post from earlier this month suggests. 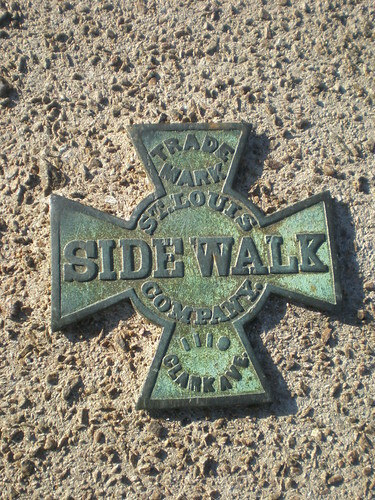 The above sidewalk marker, the last of my three new discoveries this weekend, is a very interesting example. An intact, but otherwise identical, copy of this marker on DJDenim’s Flickr stream shows the address on the sidewalk marker as 512 S. Jefferson Ave. According to the American Engineering Register of 1885, the resident at the address was a Civil Engineer by the name of Bruner, P.M.. I wonder what it was about 512 S. Jefferson that made it so appealing to these men of Granitoid? This exercise of researching sidewalk contractors using Google demonstrates the ability of the search engine, and the value of the these remarkable links to the past. As I learn more about this one aspect of cities, my overall understanding of their urban histories is increased as well. 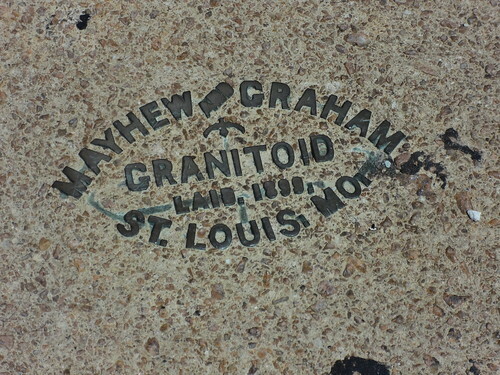 To see my entire collection of sidewalk contractor stamp/marker photos, visit this flickr map. Locations are often only as specific as the city that the sidewalk is in, but are sometimes more accurate. 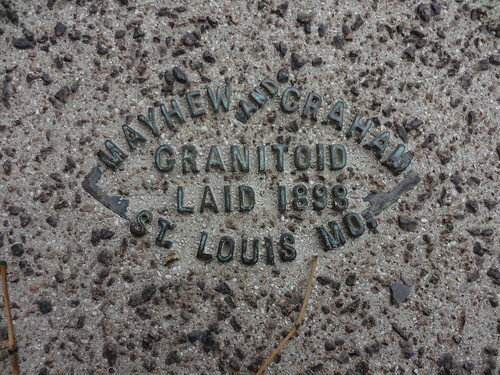 This afternoon I went up to The Ville and found three sidewalk markers that correspond with the 1896 article on Mayhew & Graham. 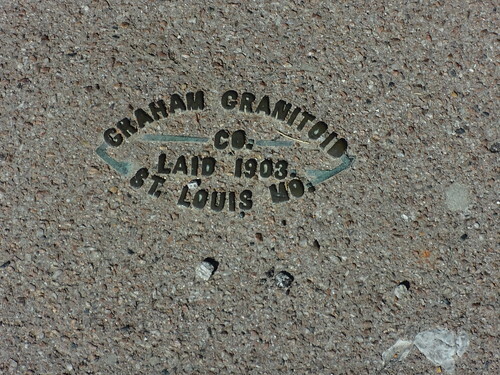 And here is a flickr set of all my St. Louis sidewalk marker photos. The details that some sidewalk stamps carry provide starting points for research that can reveal much about a city’s past. While visiting Seattle last month I came across a nice selection of sidewalk stamps and markers, the bulk of them concentrated in Pioneer Square. Pioneer Square has a remarkable history as Seattle’s original downtown. After the “Great Seattle Fire” of 1889 (seems like every American city has had a great fire), the city began rebuilding immediately, but soon after reconstruction had begun planners made the decision to raise the streets up a story to remedy a problem with flooding during high tide. 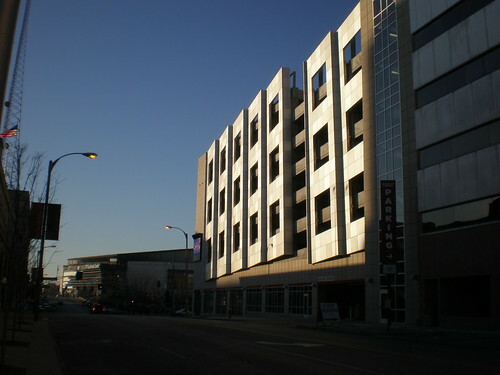 During this transition, building entrances were moved up to what became street level, and new sidewalks were built one story above the old ones. Because the original ground level entrances were sometimes still in use underground, many sidewalks in this area have skylights to allow light into the passages below. 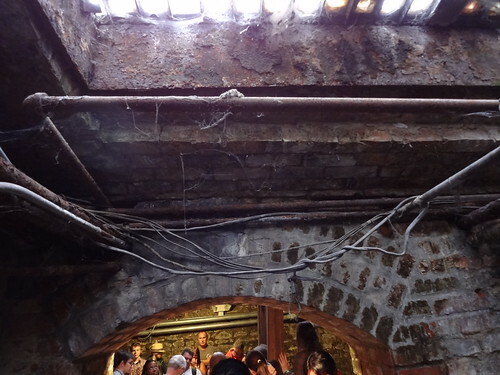 A popular tourist attraction, the Seattle Underground Tour, allows you to walk along some of these underground sidewalks and listen to bad jokes. This sight brought me back almost to the beginning of my relationship with sidewalk markers. 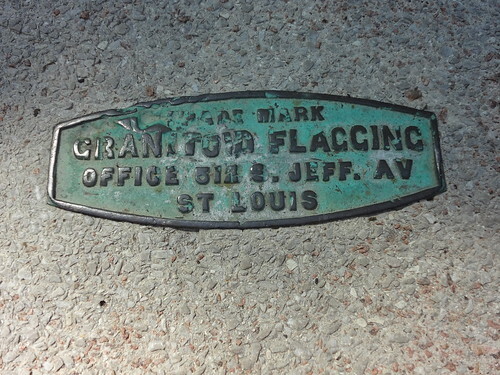 An interest that began after coming across a St. Louis Sidewalk Company sidewalk marker. After making this initial discovery I started enthusiastically searching the internet for more, and the first bit of gold I struck was a flickr photo of a P.M. Bruner Sidewalk marker in Tower Grove East. I immediately began walking blocks in the neighborhood until I found them myself, and since then I have come across several identical markers in other sections of the city. Almost every new sidewalk marker I see gets its text googled, and this one was no exception. Unlike most cement contractors, however, P.M. Bruner has a pretty serious online presence, particularly if you perform a Google Patent search. 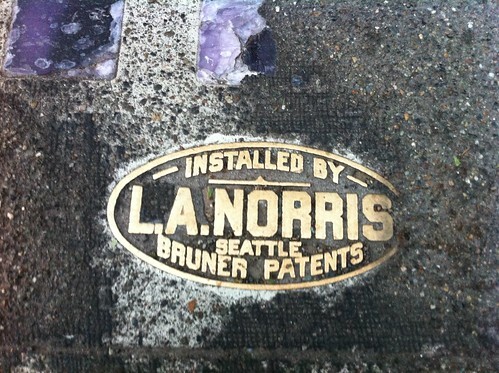 Interestingly enough, Preston Martin Bruner of St. Louis, Missouri holds several patents for Sidewalk Lights that closely resemble those visible in the photo of L.A. Norris’ sidewalk. Is it possible that a St. Louisan designed this technology that helps make Seattle’s Pioneer Square so cool? It is very possible, but unfortunately, all I can do is speculate and continue to keep my eyes and ears open. If anyone has more information on this subject, please share. 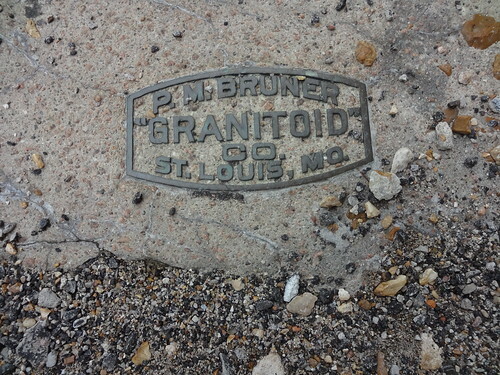 I found a website with a photo of a P.M. Bruner sidewalk with “vault lights” in Houston, TX. I’ve spent the last week or so in Seattle, and have been extremely impressed with the city. Seattle’s Central City is a continuous, walkable urban environment, that is unlike the vast majority of American cities I’ve been to. 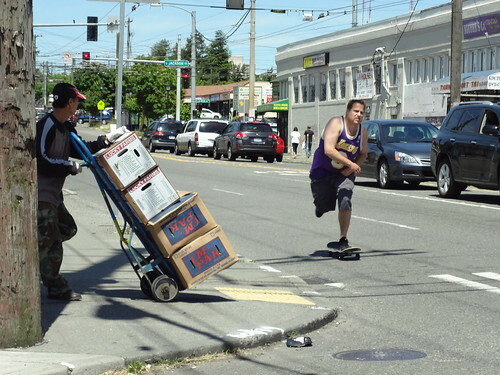 In Seattle, the “inner-city” is a truly desirable place to be (as it should be). Although it is not completly free of empty storefronts and surface parking lots, when compared to a place like St. Louis these underused spaces are a non-issue. I am aware that Seattle and St. Louis have more differences than similarities, but I disagree with those who say we have nothing to learn from a city so dissimilar. Seattle’s Metropolitan Area is not significantly larger than St. Louis’ (only having recently surpassed us), but it has the resources to experiment. We need to be paying attention to even our more distant peers if we want to stay competitive. Seattle has made many of the same mistakes that St. Louis has. They have an interstate highway running through their downtown. 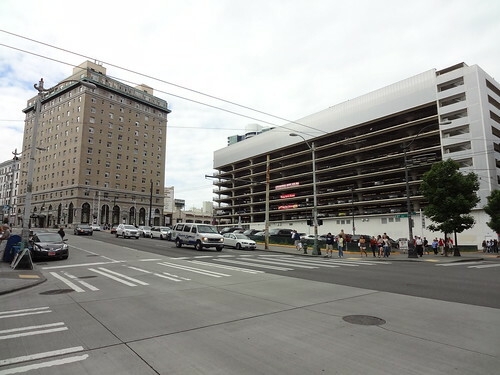 They have two major sports stadiums that take up superblocks and are surrounded by underused parking garages in a historic district. At the same time, they value good urban design and the pedestrian experience. For me, Seattle has many new ideas to offer. Good ideas. One big one that struck me is the Downtown Transit Tunnel. 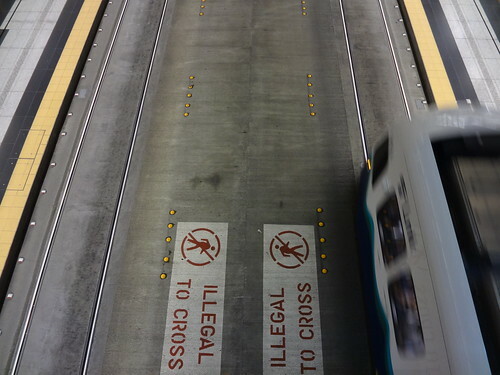 Seattle’s Light Rail runs through Downtown in a tunnel, but the tracks run on a paved, flat surface that is also used by buses. This is brilliant for many reasons (it keeps you out of both traffic and the rain), and is a flexible infrastructure investment. My one complaint is that you aren’t allowed to simply walk across the tracks to the other platform to change directions. As convenient as being able to walk across the tracks would be for an urban explorer and photographer like myself, walking up and over is a small sacrifice for us to make on behalf of public safety. 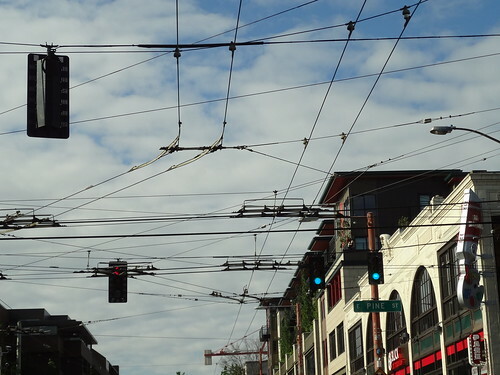 The City of Seattle actually cares about pedestrians and their safety, and it shows. Little details can make big differences. 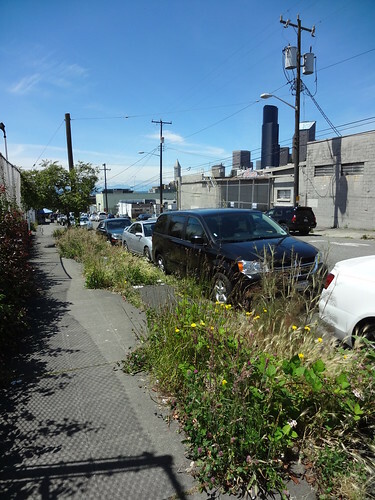 This year Seattle was recognized as the most “walk-friendly” city in the country by the NRDC, and in the City’s Pedestrian Master Plan, Seattle declares that it wants to truly become the most walkable city in the nation. Featuring before and after photos of transformed sidewalks that would be sure to make Steve Patterson proud, the Pedestrian Master Plan’s website lays out a detailed plan with ambitious goals that focus on the pedestrian experience. It outlines the benefits of walking and the responsibility of the city to encourage and to facilitate alternatives to personal automobiles. I think that the City of St. Louis can learn from cities like Seattle. Our problems are not unique to the rust belt, and their solutions might found if the time was spent creating something like a master plan. We have a long way to go before we can even compete in a walkable city competition, but we need to start with a coherent (unlike many of my blog posts – Sorry!) and comprehensive plan. Let’s start Downtown and connect our neighborhoods to one another. 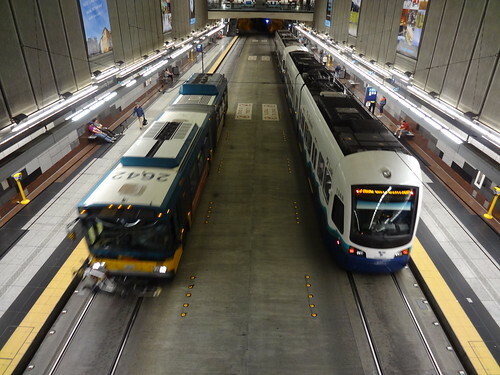 Otherwise newer, faster growing cites like Seattle will leave us in the dust. Or in the fumes of our own exhaust. Sidewalk Markers have fascinated me since the first time I saw one on a St. Louis City Sidewalk. A rare treat in St. Louis, these markers are still being used in other cities and express a particular company’s pride in their work. 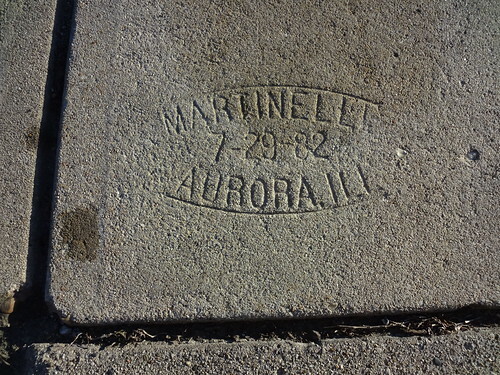 While in Evanston Illinois recently, I noticed a sidewalk marker on the campus of Northwestern University dated 2000. Similarly but less attractively, companies throughout the city stamp their information into the sidewalk as the cement dries. As you can see, these have significantly shorter lifespans than their metal counterparts but are cool nonetheless. 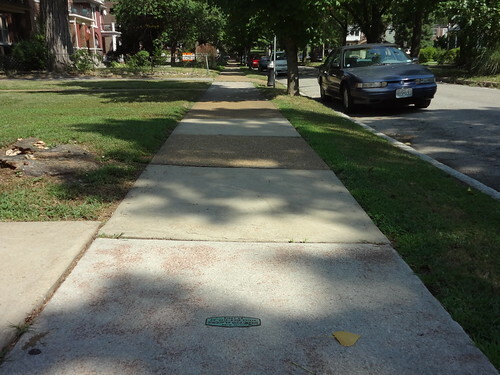 I would like to see new sidewalks in St. Louis signed by their artists again and wish that those sidewalk markers which are left over from our past were better respected. It seems that the theft of these markers is a pretty major concern of many even though their value (in my opinion) is lost with their context. 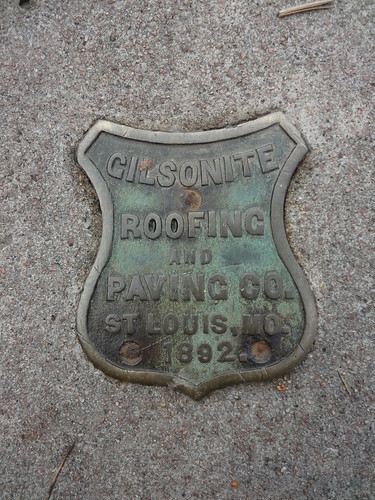 Just a few days ago while browsing St. Louis Brick I ran across some photos of a couple of these sidewalk markers (including one which I think is amazing) as well as a warning not to disclose their locations. I think this is great because it inspires people like me who always keep our eyes open for these kinds of things. I now know for sure that there are more to discover! Thanks! 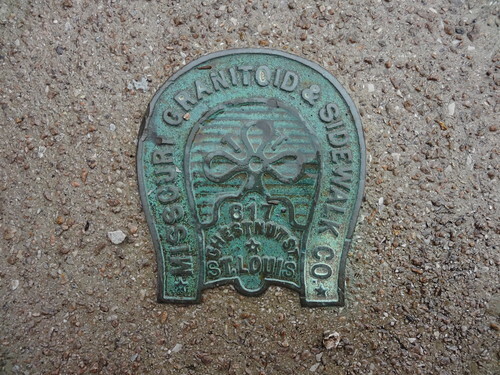 St. Louis Sidewalk Company - 1110 Clark Ave. But Google searching brought in a little more information. 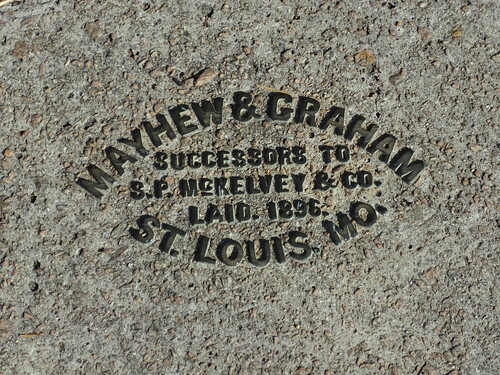 I found a reference to the company in a discussion of a lawsuit filed over a patented method of laying sidewalks (which sounds to me like the way sidewalks are laid today) invented by either two men, Kelleher and Grimm, of the St. Louis Sidewalk Company in 1892, or one man, Mayhew in 1890. The next reference I found was to a contract to pave either the sidewalk in front of the Garfield School along Jefferson, or to pave Jefferson itself. I then tracked the Garfield School down to Jefferson and Wyoming but when I visited I found that the school was built in 1936 leaving a slim chance that the original sidewalks were kept if the original school was even built on this same site. 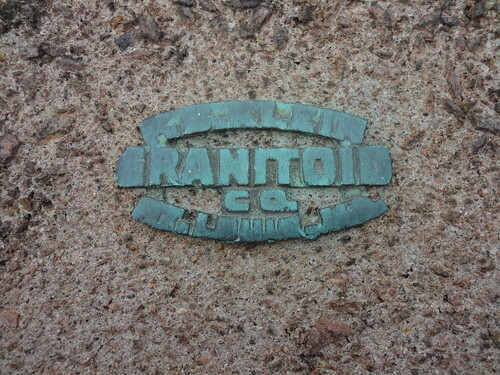 Although I don’t have too many more leads on this particular company I will continue keeping my eye out for similar sidewalk markers that could reveal some of St. Louis’ past. 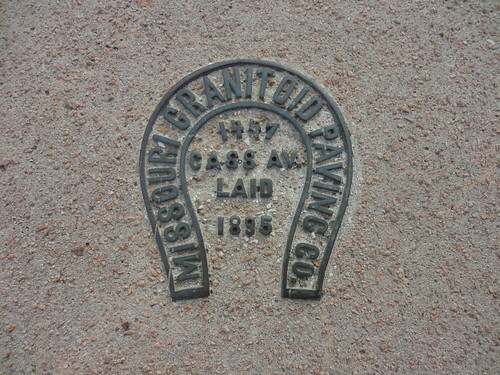 I found several other websites/blog posts related to these “sidewalk markers” including this post from Centers and Squares, and History at Our Feet: Buffalo Pavement Markers. As much as I love to see fresh new sidewalks around the city, I now must wonder what hidden treasures may have been lost in the replacement process. Here are the few photos I have relating to this post.